Freshwater is essential for our planet. It is vital for humans & wildlife to survive. 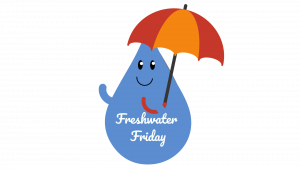 Freshwater environments include rivers, lakes, wetlands, streams and underground aquifers – these are all crucial to the water we need and drink. Only about 3% of earth’s water is freshwater, with 1.75–2% frozen in glaciers, ice and snow, 0.7–0.8% as fresh groundwater and soil moisture leaving less than 0.01% of it as surface water in lakes, swamps and rivers. Population growth & climate change is causing a huge impact to freshwater availability and by 2030 nearly half of the world’s population will live in areas of high water stress. The combination of population growth, spiralling increase in water use and pollution have put huge pressure on our rivers and streams. Research shows that a third of the water we take from rivers is wasted. The average roof collects about 85,000 litres of rain in a year. This could fill 450 water butts with free rain water. It’s okay for the lawn to go brown, it helps it to build up resistance and recover immediately after rainfall. Sprinklers can use as much as 1000 litres per hour! This is more than a family of four use in a whole day. If you have to use a sprinkler, try to use it in the early morning/late afternoon when evaporation rates are the lowest. Pressure washers should be used sparingly. Look out for water efficient models that are available. Attaching a trigger nozzle onto your hosepipe will halve the amount of water used and help direct the flow to the root of your plants. Watering cans can significantly reduce the amount of water used whilst getting the desired amount to your plants.